Silencer Vol. 1: Code of Honor is a nice surprise. I had registered John Romita Jr. as initial artist but not for some reason Dan Abnett as writer, which might've given me a sense that the book was more than the 1990s-inspired big guns and kneepads cover seemed to suggest. Instead, Silencer is good fun, outrageous and madcap in the best ways. In its violent-protagonist-as-mother, it reminds of Marc Andreyko's Manhunter, never a bad thing, though Silencer is sillier and less dark than Manhunter, like one of Arnold Schwarzenegger's comedy-action flicks. I wonder just how long Abnett can preserve the best parts of this book's premise, but I'm definitely in for a second volume. It's in short order that seemingly normal suburban mother Honor Guest reveals herself to the reader to be former Leviathan assassin the Silencer, stabbing and shooting cybernetic rival assassin Killbox and, after pasta fagioli, then taking out Breacher and Bloodvessel. Indeed, Silencer is part ode, part send-up of that comics time when "Killbox" was a viable name for a comics character; Honor left the 1990s behind her, and now it wants to pull her back in. Artists Romita and Viktor Bogdanovic are both perfect for the series; the action gets bloodier and more outrageous the longer this goes, but both artists have such an animated distance to their work that the book is never gross, just increasingly electrifying and absurd. All of this is predicated on Honor's past with Talia al Ghul's Leviathan from Grant Morrison's Batman, Inc.. Abnett and company reimagine Leviathan less as a mystic spy organization and more as the collaboration of second-rate techno-gangsters, rebelling now after Talia made some questionable leadership decisions. Personally I think Talia's been overused as a character since the 2000s post-Batman: No Man's Land/New Gotham eras and her break from Ra's (and temporary leadership of Lexcorp); we've seen Talia more independent and better realized as an independent female villain, but also that she makes tons of sloppy mistakes. Her haplessness in this book is necessary to set Silencer as the protagonist, but it does not feel like authentic Talia to me any more than it does when writers have Ra's whining and cackling like a dime novel despot. It seems like Silencer has permeated the DC Universe fairly quickly -- a mention in Super Sons Vol. 3: Parent Trap, Deathstroke's appearance here, Batman forthcoming, a cameo in Nightwing, and even an appearance on TV's Arrow. That's a good strategy for DC, arguably what they should be doing for all the "New Age of Heroes" characters -- put them in as many places as possible as quickly as possible so that they feel to the reader like they have some importance, some connection to the established DC Universe, and in that way some staying power. Abnett and company do so well in positing this former partnership between Talia and Honor that I had a feeling of disbelief at one point that they could have known each other so long without the audience ever hearing of Honor before. The strings were perhaps showing a little bit, but equally I can see the effort the creative team is putting in to the backstory of this series. Equally the creative team stretches well beyond the point of believability that Honor's family can't figure out something's going on here. Blake Guest is apparently both relaxed hipster and real estate agent successful enough to support a family and large house on one salary. He takes in stride the sudden appearance of strangers, his wife's singed hair and random injuries, and the fact that she single-handedly beats their washing machine into oblivion. Abnett and company put Silencer's "zone of silence" to good use in keeping her community oblivious to the mayhem in their midst, but that her young son doesn't wonder why he's been made to hide behind a table (while Silencer and Talia take on a diner full of cyborgs) is nonsense -- but both are also part of the book's hilarious aesthetic. I am concerned that Abnett won't be able to keep up this darling "no one knows mom is killing cyborgs" premise forever. Granted what we mostly have here is a secret identity story, of which there's precious few in the DC Universe any more, and former-era Supermen kept their identities from Lois Lane for decades, so maybe Abnett can let it ride for a while. It seems to me the temptation to tell the story where Blake finds out is too great to leave aside even till issue #50 (I bet by the end of the second year, tops, and young Ben finds out first). But then inevitably Blake must be upset, Blake must leave with Ben, and then what we have isn't Silencer any more so much as the adventures of a generic angry assassin. Clearly I want this title to go on for a while, but I'm concerned about a series wobbling on a "no one can find out" foundation (I guess it worked for ALF for four seasons). Coming up in Silencer seems to be some supernatural material, which I'm not so sure about, but then again also Batman, a team-up I'm interested to see (Silencer, in its sideways take on the Bat-verse, also strikes me as what we wanted Mother Panic to be and it wasn't). 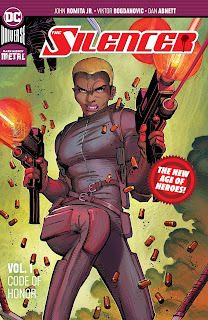 Dan Abnett scores a win in Silencer Vol. 1: Code of Honor, demonstrating his alacrity in making something out of not much here, and I thought Viktor Bogdanovic was a far better fit than on Action Comics, for instance. Speaking of Action, they've got Patrick Zircher coming up on this book, which really seems a "get," and I'm curious how his more serious style will mesh with the book.